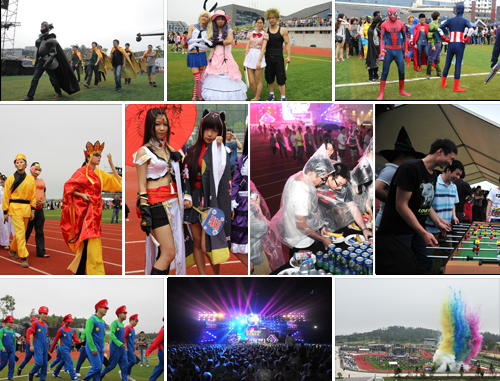 Ubiquitously-existed fantastic elements such as cosplay parade, large-scale Carnival and Super-luxurious World Cup Tour award. It’s more like enjoying a marvelous exotic performance. Now all those will appear in the 15-year anniversary celebration of NetDragon Websoft Inc. (hereinafter referred to as NetDragon). As the leading enterprise of the cultural creativity of the west coast of Taiwan Strait, NetDragon will show its innovative spirit as a design-oriented company incisively and vividly. 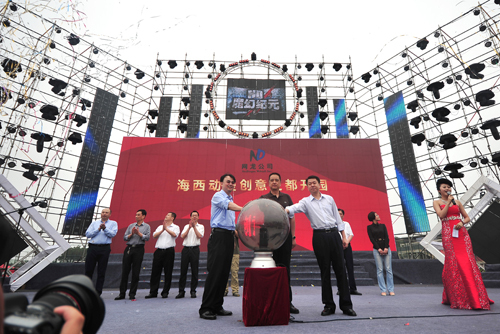 On May 18, NetDragon ("NetDragon", stock code: 777), China's leading developer and operator of online game and mobile internet platforms held "the Capital of Animation Creativity of the West Coast of the Taiwan Strait,—Opening Ceremony and 518 Era of Fantasy—Sports Meeting" in Changle City. 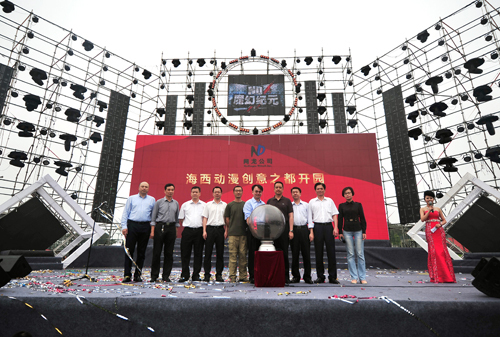 Related officials of Changle attended the opening ceremony and started the opening crystal ball together with Liu Dejian, the chairman of NetDragon. All employees of NetDragon and their families, major medias and other guests gathered together and enjoyed a splendid fantasy trip. As the leading enterprise of the cultural creativity of the west coast of Taiwan Strait, NetDragon has always insisted on the principle of "relying on the west coast of Taiwan Strait, linking the two sides, and opening to the world". The Capital of Animation Creativity of the West Coast of Taiwan Straits opened at the special moment of the 15-year anniversary of NetDragon, which also meant that NetDragon is about to start a brand new journey of the design-oriented company. "The Capital of Animation Creativity of the West Coast of the Taiwan Strait"
On the afternoon of May 18, related officials of Changle visited the opening site of "the Capital of Animation Creativity of the West Coast of the Taiwan Strait,"; they started the opening crystal ball together with Liu Dejian, the chairman of NetDragon, announcing the official opening of the event. Liu Luyuan, the CEO of NetDragon made a speech there. He said, as cultural creative enterprises in Fujian province were enjoying the development opportunity of industrial innovation, NetDragon launched the project construction of "the Capital of Animation Creativity of the West Coast of the Taiwan Strait" in Changle, the beautiful eco-city of the west coast of Taiwan Strait under the support and concern of provincial and municipal levels of government. The event of "the Capital of Animation Creativity of the West Coast of the Taiwan Strait" opened at the special moment of the 15-year anniversary of NetDragon, which meant that NetDragon will continue to give full play of their own strengths and unique advantages, keep forging ahead and attract more talents come to Fuzhou in order to infuse fresh blood to the creativity industry of the west coast of Taiwan Strait. For NetDragon, the capital of animation creativity of the west coast of the Taiwan Strait is the big stage of freeing every employee’s dream. After the first, second and third period of construction, thirteen major buildings have already been finished with chic style and different positioning, including TQ Main-building, shaping like the battleship in Star Trek, a pyramid creativity studio full of exotic atmosphere, and a Hui style architecture emanating the life style of regions south of the Yangtze River, which fully shows the collision between the sci-fi feeling of IT and Chinese traditional culture and also made the capital a design factory filled with imagination. In addition, the settlement of locomotives full of hometown atmosphere, large fantastic pirate ships, and the network beast "grass mud horse" (alpaca) also brings some kind of interest to the capital of animation creativity of the west coast of the Taiwan Strait. "Exercise because of youth; Let this exercise be unique". In the eyes of NetDragoners, what they're engaging in is to make it more interesting, more interactive, and better convey the design culture of NetDragon rather than a mediocre sports meeting. The 518 sports meeting has the theme of "Era of Fantasy". Creative NetDragoners likened the company to a diversified nation, while they are different ethnic groups living in it. At the beginning of the sports meeting, NetDragoners' cosplay representing nine ethnic groups came on stage and brought their creativity into full play on the red track. All creative team names such as Holy Code, Dragon and Knight as well as Heaven Ape showed their deep pride in their own work; multiple slogans such as "Sugar-coated haws and Moet Chandon, Little Fairy descending to NetDragon" and "Clear bugs with penetrating insight—Quality Guarantee" conveyed the creativity of the design-oriented company. If you think the cosplay opening is all about "Era of Fantasy", then you are totally wrong. At the site of NetDragon 518 sports meeting, there are various magical elements which will dazzle your eyes, such as high-end passport-like event guidebooks, guidance cards with senior executives’ photos processed with PhotoShop, 3D street painting and so on … Besides, sports competitions of NetDragon such as kayaks, three-meter diving, basketball star games, fitness PK rings and parent-child games are also brilliant. The leadership and staff of NetDragon all joined the ethnic competition and enjoyed this annual sports meeting. Who Will Win the Brazil World Cup Tour? If the sports meeting in the daytime is the ethnic competition, then the Carnival at night is the ethnic revelry. In the darkness, with a 10-second countdowning appeared on the large screen, a bunch of follow light ignited up the dynamic NetDragon Carnival officially. Different styles of creative talent shows such as Fancy Basketball PK Ultimate Cycling, Tricking Dancing and Victoria's Secret Babe Love Show lit up the atmosphere at the scene. In addition, employees of NetDragon showed their talents and skills during the interaction session which you would have trouble keeping track. With the advancement of the ethnic Carnival, the party came to its climax. The host drew the highest award of the party—Brazil World Cup tour, with cheers around the site. Shortly thereafter, aesthetic of sand painting illustrated the 15-year up-and-down history of NetDragon. The chairman of NetDragon, namely "the parent of NetDragon" in the eyes of NetDragoners—Liu Dejian took the "3D helicopter" and came to the site, awarded excellent employees with more than 100 gold ingots which values 30,000 RMB yuan each. He also led executives and employees of NetDragon to sing the song “Loving Family”. By then, the party was waning to the close with moving and happy atmosphere. Looking back the past 15 years of NetDragon, all NetDragoners always maintain a dream. As the leading enterprise of the cultural creativity of the west coast of Taiwan Strait, NetDragon shows its innovative spirit as a design-oriented company incisively and vividly. Just like "TQ Main-building" breaking the construction convention that boldly rendering creativity in the form of a spaceship, NetDragon will bravely continue to explore previously-unknown realms in the future, conveying NetDragon's culture of design.